Contact Wright & Schutle LLC today for your free Risperdal gynecomastia lawsuit case evaluation by visiting www.yourlegalhelp.com or by calling 1-800-399-0795 to speak with one of the firms experienced attorneys. Risperdal gynecomastia is a devastating condition that can have far reaching effects on a boy’s social development and quality of life. The attorneys at Wright & Schulte LLC are committed to ensuring that the victims of Risperdal gynecomastia obtain the justice they deserve. To learn more, please contact Wright & Schulte LLC for a free Risperdal lawsuit consultation to ensure you are treated fairly and receive all of the compensation the law allows. Call 1-800-399-0795 or visit http://www.yourlegalhelp.com for more information. Risperdal is approved by the FDA as an atypical antipsychotic drug to treat schizophrenia, bipolar disorder, and irritability in autistic children and adolescents. An investigation by the Los Angeles Daily News showed children in California’s foster care system have been prescribed psychiatric drugs, including Risperdal, Prozac, and Haldol, to control their behavior, although the medications have not been approved by the FDA use by children. The Los Angeles Daily News said it looked at 10 years of data that begins in 2004. The newspaper’s investigation found that nearly 1 out of every 4 adolescents in California’s foster care system is receiving psychiatric drugs, which is three times the rate for all adolescents nationwide. The newspaper reported that of the thousands of foster children prescribed psychotropic drugs in the last 10 years, nearly 60 percent were prescribed an antipsychotic, which are the highest risk psychotropic drugs. The newspaper further reported that the percentage of foster children who were prescribed two or more psychotropic medications increased from 10.1 percent in 2004 to 12.2 percent in 2013. Wright & Schulte LLC, an experienced personal injury firm, is dedicated to the belief that America’s legal system should work for the people. Every day, the attorneys of Wright & Schulte LLC stand up for the rights of people who have been injured or wronged and fight tirelessly to ensure that even the world’s most powerful corporations take responsibility for their actions. If you’re looking for a law firm that will guarantee the aggressive and personal representation you deserve, please do not hesitate to contact Wright & Schulte LLC today. 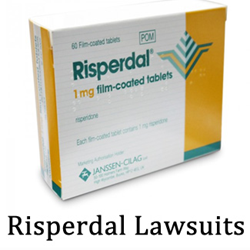 Free Risperdal lawsuit case evaluations are available through yourlegalhelp.com or by calling 1-800-399-0795.